A variety of hand tools are used in the normal course of driving and upsetting rivets. They include rivet cutters, bucking bars, hand riveters, countersinks, and dimpling tools. The rivet cutter is used to trim rivets when rivets of the required length are unavailable. [Figure 1] To use the rotary rivet cutter, insert the rivet in the correct hole, place the required number of shims under the rivet head, and squeeze the cutter as if it were a pair of pliers. Rotation of the disks cuts the rivet to give the right length, which is determined by the number of shims inserted under the head. When using a large rivet cutter, place it in a vise, insert the rivet in the proper hole, and cut by pulling the handle, which shears off the rivet. 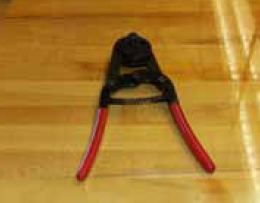 If regular rivet cutters are not available, diagonal cutting pliers can be used as a substitute cutter. The bucking bar, sometimes called a dolly, bucking iron, or bucking block, is a heavy chunk of steel whose countervibration during installation contributes to proper rivet installation. They come in a variety of shapes and sizes, and their weights ranges from a few ounces to 8 or 10 pounds, depending upon the nature of the work. Bucking bars are most often made from low-carbon steel that has been case hardened or alloy bar stock. Those made of better grades of steel last longer and require less reconditioning. Bucking faces must be hard enough to resist indentation and remain smooth, but not hard enough to shatter. 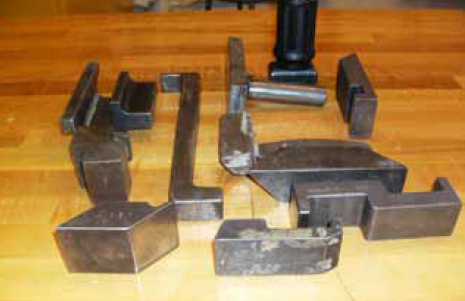 Sometimes, the more complicated bars must be forged or built up by welding. The bar usually has a concave face to conform to the shape of the shop head to be made. When selecting a bucking bar, the first consideration is shape. [Figure 2] If the bar does not have the correct shape, it deforms the rivet head; if the bar is too light, it does not give the necessary bucking weight, and the material may become bulged toward the shop head. If the bar is too heavy, its weight and the bucking force may cause the material to bulge away from the shop head. This tool is used by holding it against the shank end of a rivet while the shop head is being formed. Always hold the face of the bucking bar at right angles to the rivet shank. Failure to do so causes the rivet shank to bend with the first blows of the rivet gun and causes the material to become marred with the final blows. The bucker must hold the bucking bar in place until the rivet is completely driven. If the bucking bar is removed while the gun is in operation, the rivet set may be driven through the material. Allow the weight of the bucking bar to do most of the work and do not bear down too heavily on the shank of the rivet. The operator’s hands merely guide the bar and supply the necessary tension and rebound action. Coordinated bucking allows the bucking bar to vibrate in unison with the gun set. With experience, a high degree of skill can be developed. Defective rivet heads can be caused by lack of proper vibrating action, the use of a bucking bar that is too light or too heavy, and failure to hold the bucking bar at right angles to the rivet. The bars must be kept clean, smooth, and well polished. Their edges should be slightly rounded to prevent marring the material surrounding the riveting operation. A hand rivet set is a tool equipped with a die for driving a particular type rivet. Rivet sets are available to fit every size and shape of rivet head. The ordinary set is made of 1⁄2-inch carbon tool steel about 6 inches in length and is knurled to prevent slipping in the hand. Only the face of the set is hardened and polished. Sets for universal rivets are recessed (or cupped) to fit the rivet head. In selecting the correct set, be sure it provides the proper clearance between the set and the sides of the rivet head and between the surfaces of the metal and the set. 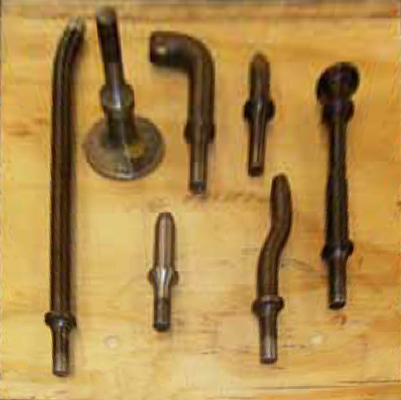 Flush or flat sets are used for countersunk and flathead rivets. To seat flush rivets properly, be sure that the flush sets are at least 1 inch in diameter. Special draw sets are used to draw up the sheets to eliminate any opening between them before the rivet is bucked. Each draw set has a hole 1⁄32-inch larger than the diameter of the rivet shank for which it is made. Occasionally, the draw set and rivet header are incorporated into one tool. The header part consists of a hole shallow enough for the set to expand the rivet and head when struck with a hammer. The countersink is a tool that cuts a cone-shaped depression around the rivet hole to allow the rivet to set flush with the surface of the skin. Countersinks are made with angles to correspond with the various angles of countersunk rivet heads. The standard countersink has a 100º angle, as shown in Figure 3. Special microstop countersinks (commonly called stop countersinks) are available that can be adjusted to any desired depth and have cutters to allow interchangeable holes with various countersunk angles to be made. [Figure 4] Some stop countersinks also have a micrometer set mechanism, in 0.001-inch increments, for adjusting their cutting depths. Dimpling is done with a male and female die (punch and die set). The male die has a guide the size of the rivet hole and with the same degree of countersink as the rivet. The female die has a hole with a corresponding degree of countersink into which the male guide fits. The most common power tools used in riveting are the pneumatic rivet gun, rivet squeezers, and the microshaver. 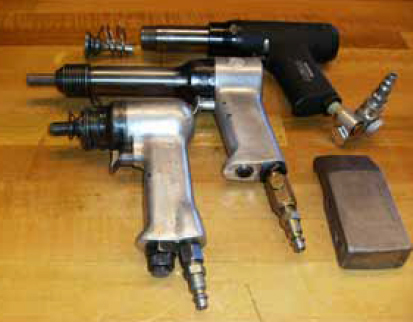 The pneumatic rivet gun is the most common rivet upsetting tool used in airframe repair work. It is available in many sizes and types. [Figure 5] The manufacturer’s recommended capacity for each gun is usually stamped on the barrel. Pneumatic guns operate on air pressure of 90 to 100 pounds per square inch and are used in conjunction with interchangeable rivet sets. Each set is designed to fit the specific type of rivet and the location of the work. The shank of the set is designed to fit into the rivet gun. An airdriven hammer inside the barrel of the gun supplies force to buck the rivet. Slow hitting rivet guns that strike from 900 to 2,500 blows per minute are the most common type. [Figure 6] These blows are slow enough to be easily controlled and heavy enough to do the job. These guns are sized by the largest rivet size continuously driven with size often based on the Chicago Pneumatic Company’s old “X” series. 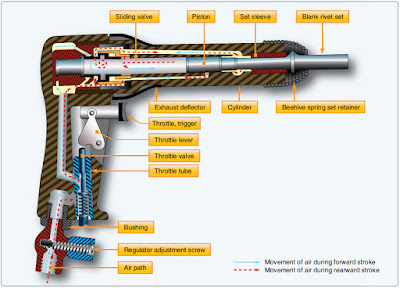 A 4X gun (dash 8 or 1⁄4 rivet) is used for normal work. The less powerful 3X gun is used for smaller rivets in thinner structure. 7X guns are used for large rivets in thicker structures. A rivet gun should upset a rivet in 1 to 3 seconds. 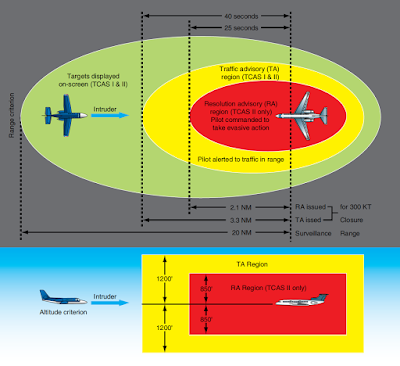 With practice, an aircraft technician learns the length of time needed to hold down the trigger. A rivet gun with the correct header (rivet set) must be held snugly against the rivet head and perpendicular to the surface while a bucking bar of the proper weight is held against the opposite end. The force of the gun must be absorbed by the bucking bar and not the structure being riveted. When the gun is triggered, the rivet is driven. Always make sure the correct rivet header and the retaining spring are installed. 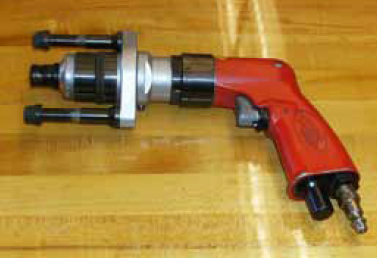 Test the rivet gun on a piece of wood and adjust the air valve to a setting that is comfortable for the operator. The driving force of the rivet gun is adjusted by a needle valve on the handle. Adjustments should never be tested against anything harder than a wooden block to avoid header damage. If the adjustment fails to provide the best driving force, a different sized gun is needed. A gun that is too powerful is hard to control and may damage the work. On the other hand, if the gun is too light, it may work harden the rivet before the head can be fully formed. The riveting action should start slowly and be one continued burst. If the riveting starts too fast, the rivet header might slip off the rivet and damage the rivet (smiley) or damage the skin (eyebrow). Try to drive the rivets within 3 seconds, because the rivet will work harden if the driving process takes too long. The dynamic of the driving process has the gun hitting, or vibrating, the rivet and material, which causes the bar to bounce, or countervibrate. These opposing blows (low frequency vibrations) squeeze the rivet, causing it to swell and then form the upset head. Never point a rivet gun at anyone at any time. A rivet gun should be used for one purpose only: to drive or install rivets. Never depress the trigger mechanism unless the set is held tightly against a block of wood or a rivet. Always disconnect the air hose from the rivet gun when it is not in use for any appreciable length of time. While traditional tooling has changed little in the past 60 years, significant changes have been made in rivet gun ergonomics. Reduced vibration rivet guns and bucking bars have been developed to reduce the incidence of carpal tunnel syndrome and enhance operator comfort. 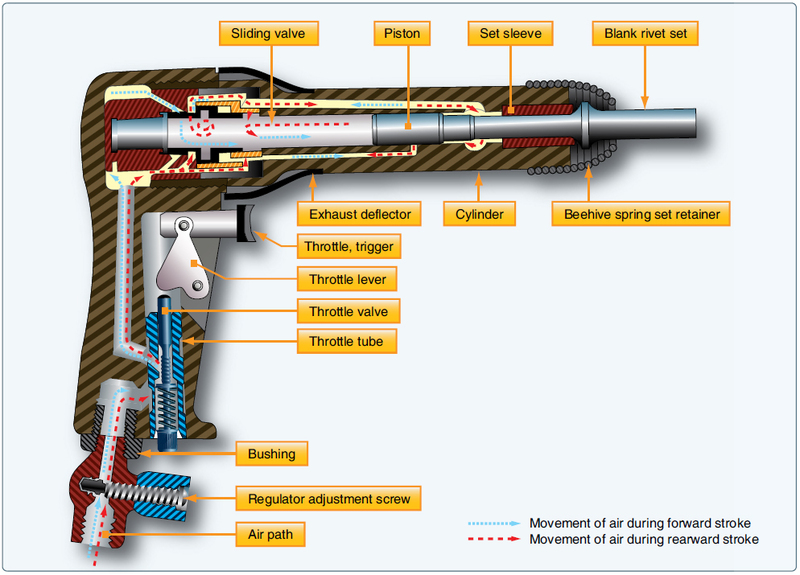 Pneumatic guns are used in conjunction with interchangeable rivet sets or headers. Each is designed to fit the type of rivet and location of the work. The shank of the rivet header is designed to fit into the rivet gun. An appropriate header must be a correct match for the rivet being driven. The working face of a header should be properly designed and smoothly polished. They are made of forged steel, heat treated to be tough but not too brittle. Flush headers come in various sizes. Smaller ones concentrate the driving force in a small area for maximum efficiency. Larger ones spread the driving force over a larger area and are used for the riveting of thin skins. Nonflush headers should fit to contact about the center two-thirds of the rivet head. They must be shallow enough to allow slight upsetting of the head in driving and some misalignment without eyebrowing the riveted surface. Care must be taken to match the size of the rivet. A header that is too small marks the rivet; while one too large marks the material. Rivet headers are made in a variety of styles. [Figure 7] The short, straight header is best when the gun can be brought close to the work. Offset headers may be used to reach rivets in obstructed places. Long headers are sometimes necessary when the gun cannot be brought close to the work due to structural interference. Rivet headers should be kept clean. Compression riveting (squeezing) is of limited value because this method of riveting can be used only over the edges of sheets or assemblies where conditions permit, and where the reach of the rivet squeezer is deep enough. The three types of rivet squeezers—hand, pneumatic, and pneudraulic— operate on the same principles. In the hand rivet squeezer, compression is supplied by hand pressure; in the pneumatic rivet squeezer, by air pressure; and in the pneudraulic, by a combination of air and hydraulic pressure. One jaw is stationary and serves as a bucking bar, the other jaw is movable and does the upsetting. Riveting with a squeezer is a quick method and requires only one operator. These riveters are equipped with either a C-yoke or an alligator yoke in various sizes to accommodate any size of rivet. The working capacity of a yoke is measured by its gap and its reach. The gap is the distance between the movable jaw and the stationary jaw; the reach is the inside length of the throat measured from the center of the end sets. End sets for rivet squeezers serve the same purpose as rivet sets for pneumatic rivet guns and are available with the same type heads, which are interchangeable to suit any type of rivet head. One part of each set is inserted in the stationary jaw, while the other part is placed in the movable jaws. The manufactured head end set is placed on the stationary jaw whenever possible. During some operations, it may be necessary to reverse the end sets, placing the manufactured head end set on the movable jaw. A microshaver is used if the smoothness of the material (such as skin) requires that all countersunk rivets be driven within a specific tolerance. [Figure 8] This tool has a cutter, a stop, and two legs or stabilizers. The cutting portion of the microshaver is inside the stop. The depth of the cut can be adjusted by pulling outward on the stop and turning it in either direction (clockwise for deeper cuts). The marks on the stop permit adjustments of 0.001 inch. If the microshaver is adjusted and held correctly, it can cut the head of a countersunk rivet to within 0.002 inch without damaging the surrounding material. Adjustments should always be made first on scrap material. When correctly adjusted, the microshaver leaves a small round dot about the size of a pinhead on the microshaved rivet. It may occasionally be necessary to shave rivets, normally restricted to MS20426 head rivets, after driving to obtain the required flushness. Shear head rivets should never be shaved.